Thyroid dysfunction can affect the orbit. Graves ophthalmopathy (so called because it is generally associated with Graves hyperthyroidism), Graves orbitopathy (GO), dysthyroid ophthalmopathy, thyroid-associated ophthalmopathy (TAO). It is an inflammatory disease (not an infection) affecting the orbital tissues, mainly fat and muscles, as well as producing signs eyelids as lid retraction, proptosis, or diplopia. It is a chronic disease with acute or subacute onset. Generally associated with hyperthyroidism, but can also occur in hypothyroidism. In up by 20% of cases the disease appears first in the orbit, thyroid hormones still being normal for 6 months or more. The exact cause of the disease is not well understood. There are certain molecules present in the thyroid and in the soft tissues, muscles and eyelids called antigens. Against these antigens we develop in some cases an immune reaction that is created by the antibodies directed against these molecules which are not recognize as their own. This will trigger an acute inflammatory process by increasing edema (fluid) in the cells. 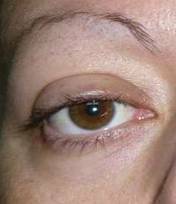 The result is an increase in the volume of the orbital tissues with exophthalmos, and muscle thickening, leading to eyelid retraction (by stimulation of a muscle which raises the lid). This acute phase can last from 6 months to 24 months. Once past the acute phase, the chronic phase begins. Orbitopathy occurs in approximately 15-20% of patients with hyperthyroidism, being with the frequecy being lower in hypothyroidism. It affects a higher proportion of women than men, with a proportion of 6 to 1. It is the leading cause of orbital disease. Almost half of all cases are undiagnosed. The age of onset is usually between 25 and 60 years. It is more severe in older men and diabetics and has a strong relationship between snuff and worsening. The relationship of snuff with orbitopathy and extreme forms of this is strong. Exact causes are not exactly known but may be due to lack of oxygenation of the tissues. It is therefore very important that the patient stop smoking absolutely. The initial clinical presentation is sometimes very subtle: conjunctivitis that mails to respond to standard treatments, tearing, feeling of pressure in the eyes, changes in vision. Despite being common symptoms in other diseases, we should be aware when this happens to a young woman, it may be the beginning of an OG. Photophobia, eye irritation, eye pain and rendez: especially in acute phases. At first they are very obvious. Signs of active disease must be sought. 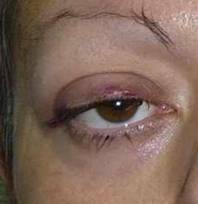 Eyelid retraction: it can occur both in the acute and chronic phases. With thyroid treatment it can improve 50% over two or three years. We must explain to the patient the only solution may be eyelid retraction surgery. It tends to be confused with retraction due to exophthalmos. 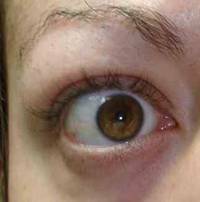 Ptosis: a late manifestation of shrinkage. Exophthalmos: eyeball protrusion forwards occurs in later stages of the disease. It is the most obvious sign but not the most common. It can remain unchanged for years. The eye is displayed by the volume increase due to fat and muscle pushing the orbit. In severe cases it can cause optic nerve traction and corneal injury from exposure. 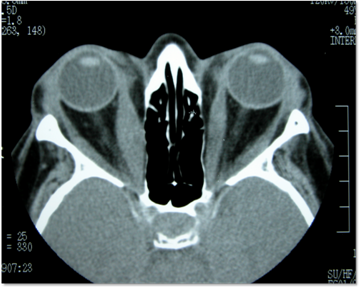 In this case orbital decompression is the preferred treatment. 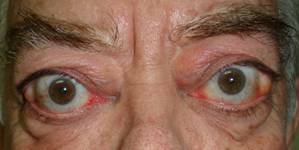 Increased fat bags and eyelid edema: edema occurs primarily. Treatment is Blepharoplasty in non-acute phase. There is no other treatment for relief of these symptoms. Edema is higher in the morning. Double vision: It is due to muscle thickening, which causes restriction of movements leading to diplopia. In later stages the muscles become fibrotic and treatment is surgical. 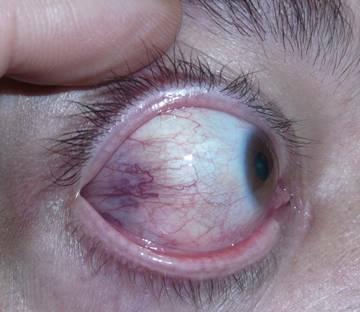 Increased ocular tension: increased ocular pressure due to muscle pull on the eyeball. With eye movements, muscle fibrosis induces high mechanical pressure on the eyeball. These patients are treated with eyedrops used for glaucoma. Involvement of the optic nerve: Optic nerve damage affects a very small number of patients. It appears in extreme exophthalmos with great traction. In these cases early orbital decompressions must be performed. Corneal involvement: Due to the large exposure of the cornea that exists when there is a large exophthalmos and retraction of the eyelids, corneal lesions may appear and can occasionally become very serious. 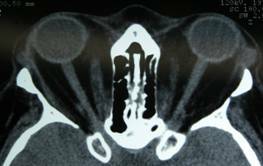 It is another indication of orbital decompression. There are usually two phases: a very acute phase and a chronic phase with sequelae. Treatment is based on early detection and pharmacologic treatment in the acute phase. The acute phase usually lasts 6-12 months and usually stops spontaneously. 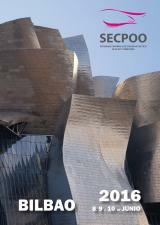 Improvement can be achieved with corticosteroid therapy. In the chronic phase, drugs are ineffective and treatment lies in the different surgeries that will solve every problem that arises. The percentage of patients with severe forms of the disease is low, approximately 4-5%. The disease is linked to the thyroid, but the patient must understand that their relationship is not always direct. They may have ocular symptoms and normal hormone levels. Likewise hormones can have high levels with little ocular symptoms. Low thyroid hormones do not rule out the disease. It has been documented that a percentage of patients who are going to undergo radioactive iodine treatment may worsen their orbitopathy. 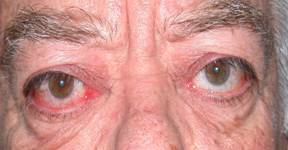 Similarly phases of hypothyroidism can modify the orbital disease. It is therefore essential to monitor endocrine hormones not only by direct analysis but also more specific antibodies. The relationship with the ophthalmologist should be as close as that with the endocrinologist. The ophthalmologist will perform a thorough examination and fill a protocol in which several parameters are measured based on the signs and symptoms that the patient suffers. This helps to classify severity. This classification will help to determine choice of treatment. Being a chronic disease, the relationship with the ophthalmologist will be long. In principle if it is stable or chronic phase requiring annual check-ups. All newly diagnosed patients with hypo or hyperthyroidism should be seen by an ophthalmologist to detect subtle changes that may signal orbitopathy. Do not wait until the patient has clear symptoms. In case your endocrinologist decides to start radioiodine treatment, you should consult your ophthalmologist. You should know that a percentage of patients may worsen their orbitopathy after this treatment. Your ophthalmologist may recommend steroid use prior to iodine. Treatment will depend on the stage. The most basic measures are to protect and lubricate the eye surface with artificial tears, use sunglasses for photophobia, night occlusion, using prisms if diplopia is present. In the active or inflammatory phase essential treatment is taking steroids at high doses and for a period of weeks. These steroids may also be injected into a vein (dose shock) or into the orbit. If steroids are not effective other immunosuppressive drugs (cyclosporine, azathioprine) or immunomodulators may be used. In the chronic phase In this phase in which there is no edematous component and fibrosis may be present along with sequelae, drug treatments will not cause improvement. We refer to this as surgical rehabilitation phase. Before acting on this phase we observe an exacerbation-free period of between six months to a year. Patient is likely to need more surgery. - Involvement of the eyelids can be done as blepharoplasty surgery. Correct the upper eyelid retraction by excision surgery involving a small muscle. - Double vision: we act upon the orbital muscles, both in the affected and healthy eye, reinserting them in a more posterior position. It is done through the conjunctiva. 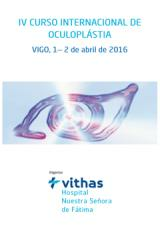 - In severe cases, if there is risk of optic neuropathy or corneal injury we will resort to orbital decompression. 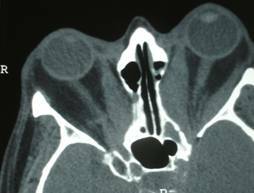 With this surgery we attempt to break the bone walls for the orbital contents, herniate orbital volume and expand and improve exophthalmos, neuropathy and the cornea. Despite being an aggressive surgery, it currently can be performed by conjunctival incisions. Depending on the degree of exophthalmos we will act on bone walls 1, 2 or 3. Surgery is performed with microscopy. - After decompression surgery if the muscles were previously thickened, the patient may experience double vision in 20-30% of cases. If the muscles are thin the risk is lower. - Depending on the wall we break we reduce the exophthalmos between 2 and 4 mm. In 2009 a committee of experts meeting in Amsterdam issued some recommendations in order to improve prevention, diagnosis, treatment, rehabilitation and education regarding this complex and common disease.